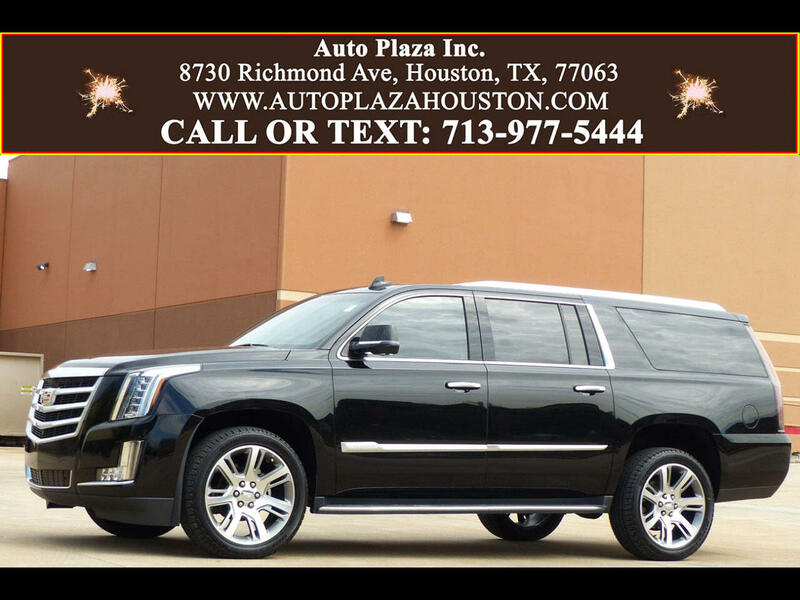 Used 2016 Cadillac Escalade ESV 2WD Luxury for Sale in HOUSTON TX 77063 Auto Plaza, Inc.
Auto Plaza Inc Proudly Presents this Super Low Mileage One Owner 2016 Cadillac Escalade ESV Luxury Edition!! Options are plentiful and include, Heads Up Display, Navigation, Power Sunroof, 4G Lte Wifi Hotspot, Wireless Charging Pad, 110v Power Outlet, 360 Degree View Camera System, Front and Rear Parking Sensors, Running Boards, 22" Chromed Aluminum Wheels, Forward Collision Alert, Side Blind Zone Alert, Rear Cross Traffic Alert, Lane Keep Assist, Apple Car Play Compatible, BLUETOOTH for Phone, USB Port, CD/DVD/MP3 Player, Satellite XM Radio, BOSE Premium Audio, Power Heated/Cooled Leather Seats, 2ND Row Heated Bucket Seats and Power Release, 3rd Row Seating, Remote Vehicle Start, Audio Controls on Heated Steering Wheel, Rollover Protection, Remote Keyless Entry and Start, Auto Tri Zone Climate Control, ONSTAR, Adjustable Pedals, Fully Locking Rear Differential, Tow Receiver, 3.23 Rear Axle Ratio, 7,300lbs GVW Rating, Stabilitrak, Fog Lights, Luggage Rack, Power Liftgate, Tire Pressure Monitor, Magnetic Ride Suspension, Rear Audio Controls, Power Windows, Power Locks, Power Heated Mirrors, and More! This 2016 Cadillac Escalade has the highly sought after exterior/ interior color combination!!! This Escalade comes with a theft recon title, So, What Are You Waiting For? Call Now!! !